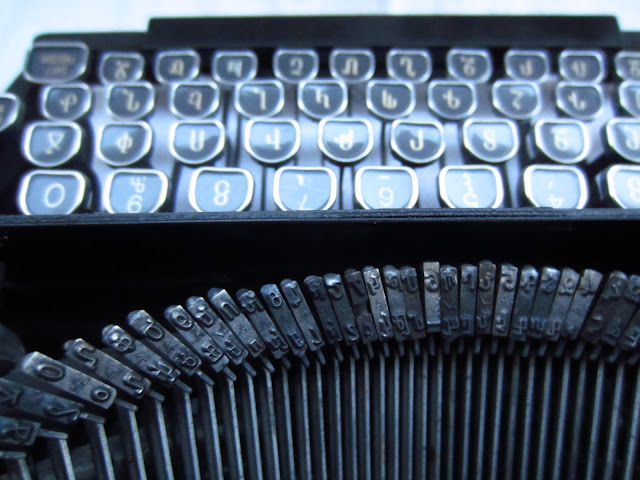 It is comforting to know I am not the only one who has had some trouble lately devoting as much time to blogging as before, or even using their typewriters quite as regularly. It is a shortcoming of mine, I am afraid, that while duties - even perceived ones that are in reality purely voluntary, like typecasting and typing letters - pile up, I procrastinate by shifting my attention elsewhere for a while. Still, this blog has been known to document typewriter sightings and has been deficient in those for some months now, so let me start where I left off with my trip to the RetroTechnica Fair in late October. Speaking of sewing machines, RetroTechnica was a fine place to discover them en masse - although in general they are not hard to find locally. Above, a seller was offering several models from the '20s and '30s. I snuck a picture of this fellow demonstrating the inner workings of a Bernina 730 (the same model I have). I silently shared his admiration for the machine - mine continues to go strong and will celebrate her first anniversary with me in May. His asking prices were steep, but I suppose worth it for all the knowledge and refurbishing he seems to be doing. A combined sighting - my favorite kind! This lovely little Elna Grasshopper is obscuring your view of a very handsome Hermes 2000. They do make a fine couple - both of them being exemplary specimens of Swiss ingenuity and '40s manufacturing. The ever-popular Corona 3 made several appearances at RetroTechnica (I counted three), but this was the best of the lot. 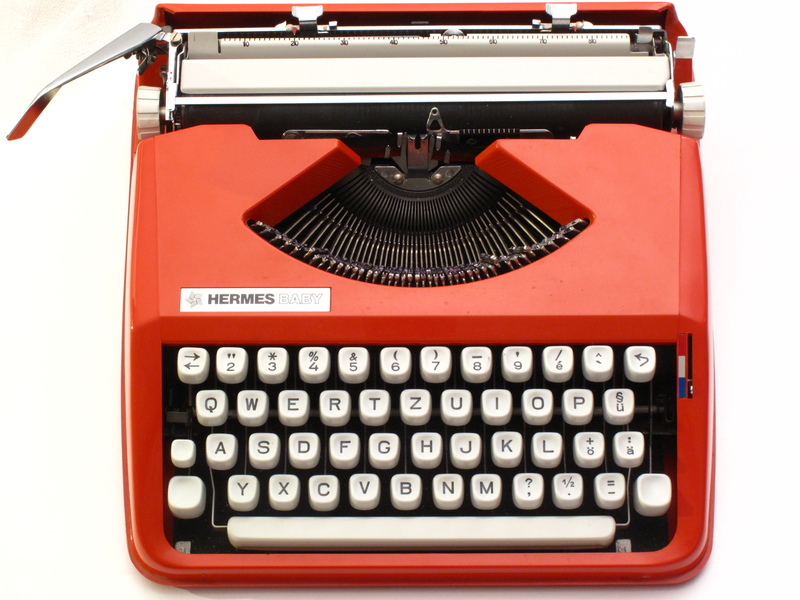 I don't have one of these, but with my Senta Fraktur I have been able to experience the "joy" of typing on a three-bank keyboard, and one is enough! A finely-preserved Remington Portable No. 1, sold by the same fellow from whom I bought a tiny Hermes 2000 printing block. What would a sighting be around here without the classic German-made index typewriter from Mignon? And so it goes. Unremarkable bulbous Remington, but dutifully documented all the same. I am fairly sure this Royal flat-top made an appearance at RetroTechnica 2011; perhaps the repeat visit is related to the price tag (CHF 70). 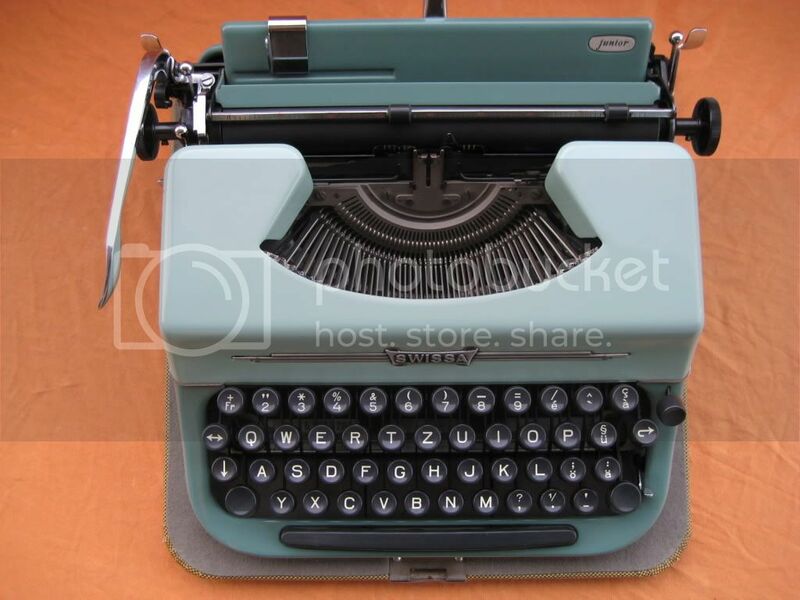 Erikas are getting more and more numerous in Switzerland - certainly more have appeared on our auction sites and in our markets than I remember from 2010, when I first started taking notice of typewriters. There weren't very many Olivettis at RetroTechnica this year, as I remember it, but it was comfortingly familiar to see this Studio 44. A whole bunch of cases I didn't feel like crouching down and opening - three Hermes 2000s (the smaller cases are from the '40s models and the larger one is from its '50s iteration) and one white '70s Hermes Baby. I'm lazy, I know, but so is the seller! Stenograph machine - counts as a sighting, the carriage and platen look wholly lifted from a typewriter! Oh, a few more sewing machine sightings will bookend the post nicely: here is a Singer 222K much like the one I have, only this fellow was selling his for about four times what I paid for mine! Ah, the thrill of a good bargain. Not that I use mine - it has attained "collector" status and I occasionally take it out to drool over. Another combined sighting! These sewing machines don't look all that "retro" and probably aren't - I am sure they were sold in the past fifteen years at the earliest. That Remington standard on the floor, though, is worthy of her place (and deserves a better perch). Another Grasshopper - but of course. She was once tremendously popular and she won't let you forget it! Greetings and salutations, and a Happy New Year! There has been a bit of a quiet spell around here, but I hasten to assure you all that it was a comfortable silence, not a sinister one, in which I sat back affably and took stock of my various hobbies, doing a bit of this and a bit of that, and sighing wistfully when the holidays ended and it was time to return to work. Ah, well. 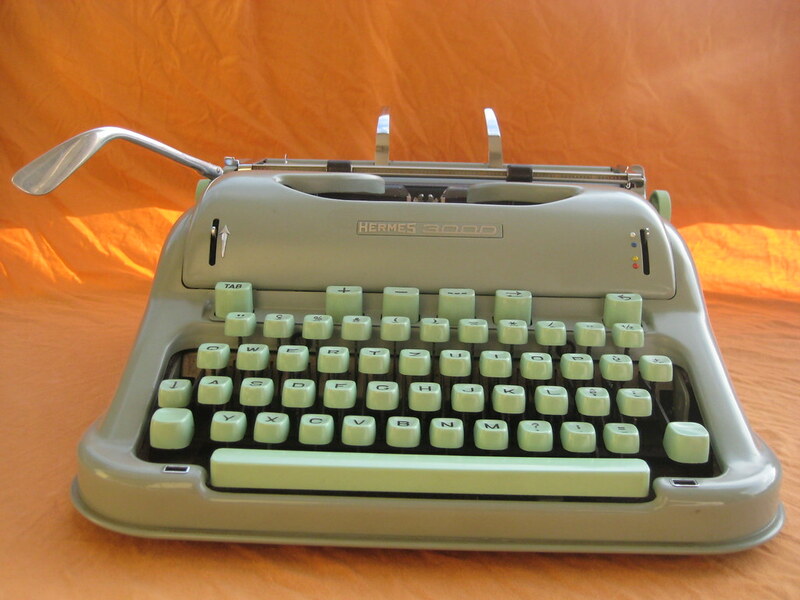 In October, for instance, I received a letter from fellow Swiss typewriter collector Herr Alfred Wepf, in which he expressed a desire to have the Armenian Royal Quiet de Luxe I had left behind, as you may remember from this post. Now, I myself had little use for it, and even though a couple of other typospherians were intrigued, it seemed a bit hard to justify for them as well. But Alfred was smitten, so I returned to the store on a rescue mission... and there was the case, just where I had left it. After bringing it home, I took the opportunity to take a few photographs before shipping it off. Here is a look at the label affixed to the inside of the case... as you can see, it was originally sold in New York. It was just as well-maintained as I had gathered from my first impressions, with the exception of a few baby dust bunnies here and there. I don't have one of these tombstone Royals myself, so I was glad to get a closer look and try it out. The winter light was not exactly ideal, but I did my best. Quite a handsome machine, and a pleasure to photograph! I merely did a run through of all the letters, in both upper and lower case. The type slugs didn't need much cleaning, either. Fare thee well, Royal, and here's to wishing you a very happy 2013 playing a starring role in Herr Wepf's fabulous collection!